Hydration is essential in Summer months, but water can get pretty boring. This watermelon salad is full of hydrating foods which will leave you glowing from the inside out, hence the name “Watermelon Glow Salad”. It is hot here in Toronto. As I’m writing this post and recipe for you, it’s about 30ºF with so much humidity in the air. Don’t get me wrong, I am NOT complaining about the weather. But I prefer a dry heat rather than this humidity which is making my hair queen of the frizz kingdom. One of my favourite things about this salad is that it goes with everything and gets better the longer it sits. As I’ve said before, I’m not a die-hard “meal prepper”. I’m more of a leftovers gal, we generally make four portions for dinner so that both Topher and I have leftovers for lunch the next day. That makes this salad perfect, because it just keeps getting better, well overnight at least! If you are heading out to a potluck or going to the cottage for the weekend, this is the perfect salad. It’s hydrating, easy peasy, and super yummy. Watermelon: is a rich source of citrulline, a certain type of amino acid that is metabolized to turn into arginine in the body. Arginine is essential for healthy sperm so is great for male fertility. Watermelon is a great source of antioxidant Vitamin C, Vitamin A, as well as lycopene. Lycopene is an antioxidant that is known for it’s anti-cancer benefits. Watermelon is also known to be anti-inflammatory, making it great if you are suffering from any digestion issues. Cucumber: contains vitamin K which is a known blood builder, this helps with fertility by building blood and supplying it to the uterus. Cucumbers contain several types of antioxidants, which protect DNA from oxidative stress and damage. Cucumbers also contain Fisetin, an antioxidant known to boost brain health and preserve cognitive function. Cucumber is also a cooling food, which makes it really great for hot Summer days. Parsley: is also a rich source of antioxidants. Parsley can also be referred to as a “chemoprotective” plant. This is because it helps protect DNA from damage, stops cell mutation and helps induce apotosis, or the death of harmful cells. Parsley is also shown to help improve digestion and acts as a diuretic, and therefore aids in healthy kidney function. 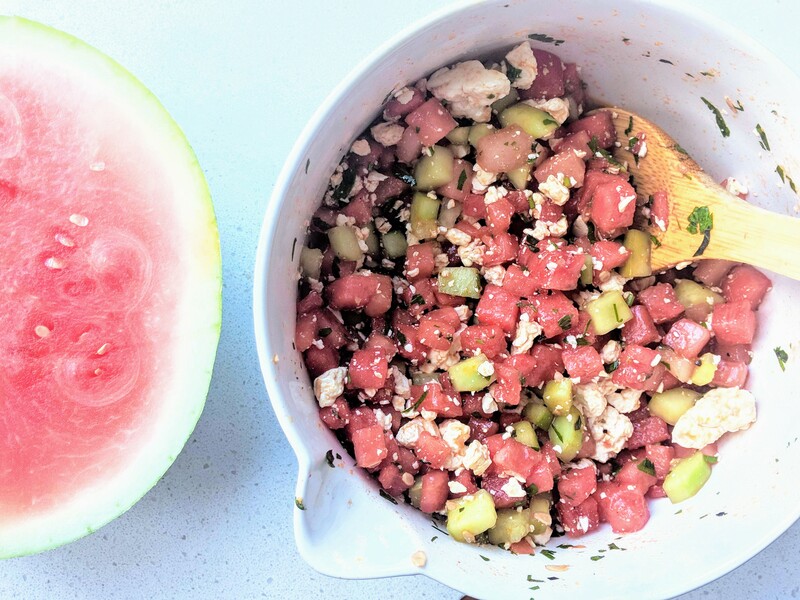 Chop your watermelon and cucumber into 1/2 inch cubes. De-seed and mince the jalapeño. 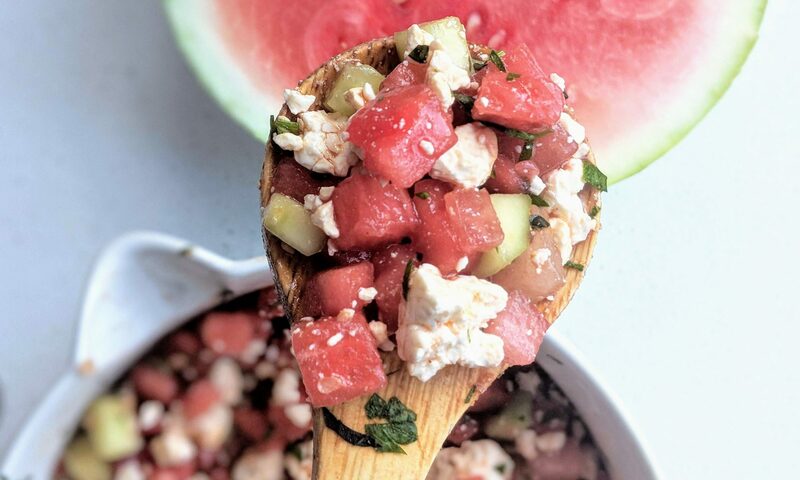 Add watermelon, cucumber, jalapeño, and crumbled feta to a large bowl. Stir to combine. Add in finely chopped fresh herbs, arugula (if using), pepper, balsamic vinegar, and olive oil. Stir gently to combine. Serve right away or stick it in the fridge to marinade before serving. If you are using arugula, add it in right before serving. No one likes soggy arugula!